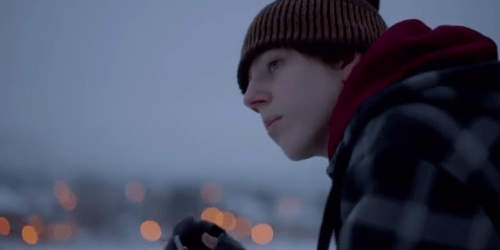 I’m about a month late to the party on this, but I wanted to put down some thoughts on Apple’s 2013 Christmas ad for the iPhone, titled ‘Misunderstood’. The ad is embedded below. It focuses on a shy teenager who is spending time with his family for Christmas, but appears always at a distance from the things going on around him, constantly glued to his phone. The big (emotional?) reveal at the end is that in fact he has been recording everything, and his gift to his family is a movie that stitches together their time, telling the story of their Christmas. We get to see the family’s response to this unexpected culmination of the teen’s labour – the laughing, the tears, the warm embrace from his father who had, in Apple’s narrative, ‘misunderstood’ his son. He wasn’t disengaged after all. The reason they are surprised and relieved, of course, is that most young men and young women—and tweens and olds and anyone, really, with access to a smartphone—act exactly like Sullen Male Youth. All the time. We Instagram meals before we eat them, tweet jokes about news stories we haven’t yet read. If anything, the unfortunate default mode for many of us is hiding behind phones, inside apps. Any other use case sends us into paroxysms of joy and relief. I won’t bother railing too heavily against the hyperbole here because I guess it has its place, but I do want to pick up on Barrett’s reading that the family in the ad is connecting not with the teen’s movie, but instead with the revelation that the teen hasn’t been totally disengaged the whole time. I actually think it’s a bit of both, and even if it is more of the latter, how is that bad? I think that advancing a discourse that doesn’t frame young introverts as disengaged, apathetic hermits is entirely positive. Apple is inverting the spectre of the screen-addicted, apathetic teen here, suggesting in its place the figure of the sentimental, observant record-keeper. I’ll end this post with another story about a shy young man finding his voice. I think it serves as a useful lens through which to read Apple’s narrative. Enjoy! Tagged Apple, shy, teenagerBookmark the permalink.